Mary Immaculate Old Students Association formed in 2008, Silver Jubilee Year of the school with a great outlook to get the service of MIHS Alumni’s to the society. MIOSA after it formed worked together to achieve most of its goals in its first year itself. Their excellence in taking up activities is a model to all students of the school and to sorrounding society. 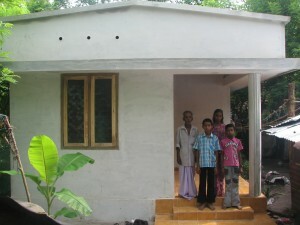 MIOSA chose to build a Home for a poor student in the school as a monument of Silver Jubilee of the school. MIOSA collected the fund from its members to finish the work. The build home consists of one living room, one bed room, kitchen, bath room and toilet. The foundation stone laid on 17th August 2008 by Sr. Elza Varapadavil, founder head mistress of MIHS and home was blessed by Fr. George Edezhathu, Vicar of Our Lady of Assumption Church Poomkavu and handed over on 17th May 2009. Other than the MIOSA members the major contributor to this project is Lions Club Oppenheim, Germany who gave genrous help in this project. In 2009 MIOSA sponsored 26 students of the school who desperately need financial care to continue their academic career by bearing complete expenses of the students. Student Care will be a recurring project which adds one more student in each year as beneficiary. The package for each student include One pair School Uniform, 10 Notebooks, Instrument Box and complete fees for the academic year. Each package totally worth around One thousand rupees. A committe including the HeadMistress and teachers selected the beneficiaries for the project. 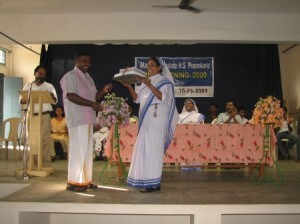 2009 Student Care package was handed over to Sr. Lissy Ignasius, Head Mistress of the school by Mr. Jayan Thomas, General Convenor, MIOSA on 10th June 2009 in Merit Evening 2009 conducted by the PTA and MIOSA in presence of DEO in charge Mr. Babu.